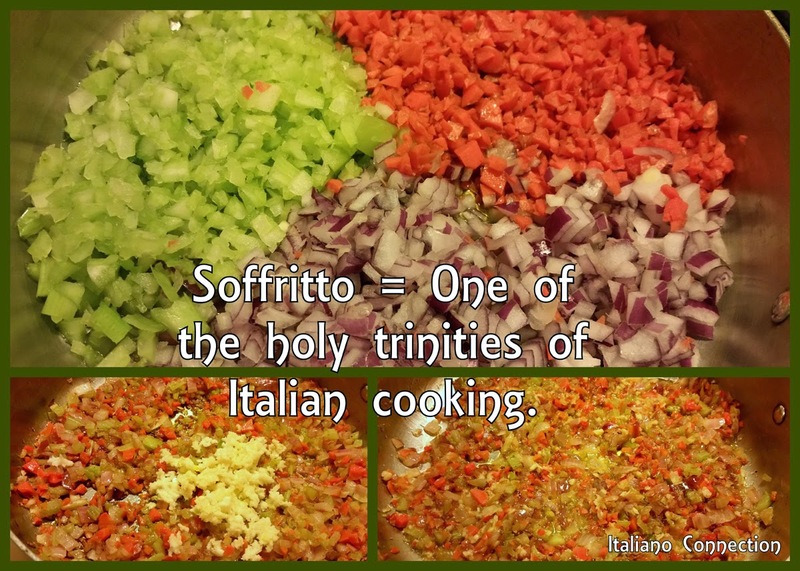 Soffritto - The start to most Italian or Tuscan cooking. Known as one of the "holy trinities" in Italian cuisine. On Sundays, as many cooks do, I make up some sort of "base" for some of the meals in the upcoming week. Whether it is a big pan of sauce/marinara, a roast, or a lot of garlic chicken, it will surely be something to make dinner a little less work on the busy week days, but still put a delicious meal before us at the family table. Last night my choice was Italian Infused Chicken (recipe to post this week). I have meals planned this week for it, which you will see in upcoming posts. Now I started my concoction late at night. Everybody was in bed. I knew this was a huge mistake as soon as I started the Soffritto. Let me explain why. First, do you know what the Soffritto is? It is the base of aromatics used in most sauces, stews, soups, etc in Italian cuisine. In French cooking they call it Mirepoix and in Spanish cooking it is called Sofrito. Most countries have a combo they consider their "holy trinity" of aromatics that must be sauteed in olive oil and/or butter to flavor the rest of the meal. For Italy these three are onions, celery, and carrots finely diced with a mezzaluna or knife. Most Italian cooks I know throw in some minced garlic in the last couple of moments too...which I think then makes it an "off-the-hook quadripartite." I also salt and pepper my soffritto while sauteing. Chef Benedetta Vitali explains, "Mastery of the soffritto is the key to an understanding of Tuscan cooking. It is the foundation on which many Tuscan sauces, and other dishes are built." This is why there was trouble in my household. Everybody was in bed either trying to fall asleep or they were out like a light. Soon as I started sauteing, I knew Monday morning was going to be rough. Why? Because my family is beckoned by the smell of the Soffritto by itself, but once I add the garlic, 100% guarantee they will come. You know like Field of Dreams or Noah's Ark..."if you build it, they will come." Well in our house it is, "If you cook it, they will come." Sure enough, one by one like ravenous zombies, they came out of their rooms, "What are you cooking?" I explained it was a long way from being completed and it was for meals this week to return to bed, but none would go without walking up to the pan to deeply inhale the aroma, which puts the most "angelic smiles" on their faces. No wonder it is called the "holy trinity of Italian cooking." Herbs are another story, but they can be added to your soffritto. It depends on their purpose. If you want them to flavor meat, then you add them at the end of your saute of your soffritto, but if you want them to flavor sauce in a way they are distinctly picked up in the mouth, then you would add them toward the end (and again all of this is dependent on if they are fresh or dried herbs). If you want them to blend and not be pronounced, then you would add them at the beginning of your sauce. It just depends on your goal. If you find yourself feeling too rushed for time to chop up a soffritto just to "start" cooking, then you could chop up your three main ingredients and store them in individual cooking portions in your freezer. I would not add the garlic to this, as you never want to saute garlic for long or it can become bitter or burnt instead of delicious. Freshly mince your garlic when you are ready for it. Then it is simple to get moving any night of the week with a most scrumptious meal.